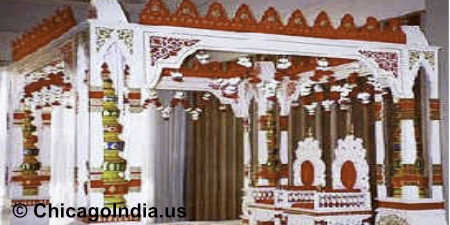 No Hindu, Gujarati, Telugu, Punjabi, Tamil or a North Indian marriage is complete without a Wedding Mandap. A grandly decorated mandap with flowers and lighting puts a special glow on the faces of the bride and bridegroom. And, desi wedding mandaps come in various sizes and designs - Peacock mandaps, dome mandaps, sankheda, fabric mandaps do look grand. Man, it's extremely hard work to get them right. Chicago is home to a few Indian businesses providing mandap rental service to South Asian, Hindu and Sikh weddings.